Our debut album, Opening is available. You can download it (or individual tracks from it)or purchase the hold-it-in-your-hand version at CD Baby. Just click on the icon below. 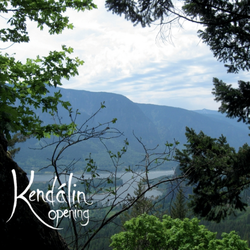 Opening is a great opening hit for Kendalin - Highly Recommend! I found Kendalin from their kickstarter campaign for their next album, Rising. I listened through the album in the samples below and found myself hooked! There aren't many albums of artists you don't know at all, where you listen to the samples and say, "I could listen to this album again and again" - that's my reaction to Opening. As I listened to them more I thought, this group has to be from Ireland or Scotland; but no, they're from Oregon... They even have the accent! I was pretty surprised. For some reason, my favorite song is "Wind in the Chimney." Its a chilly song, a woman who misses her lover and is waiting in a windy, cold location. As another in a distance relationship, I can sympathize. Rachel's Reel, Mairi's Wedding, Flicker, and Summer Solstice have a great beat to them. Rill is great too - but really they all are. I'm really looking forward to their next album when it comes out! Highly recommend! This is a pretty cool album. A nice mixture of instrumental pieces and vocal harmonies. Standout vocal pieces are Mairi's Wedding and My Johnny Was a Shoemaker. The instrumental piece, Flicker, reminds me of Loreena McKennit's band. Highly recommended!